Major General Marianne Mathewson-Chapman, Ph.D., was the first woman in the Army National Guard to be promoted to the rank of Major General. 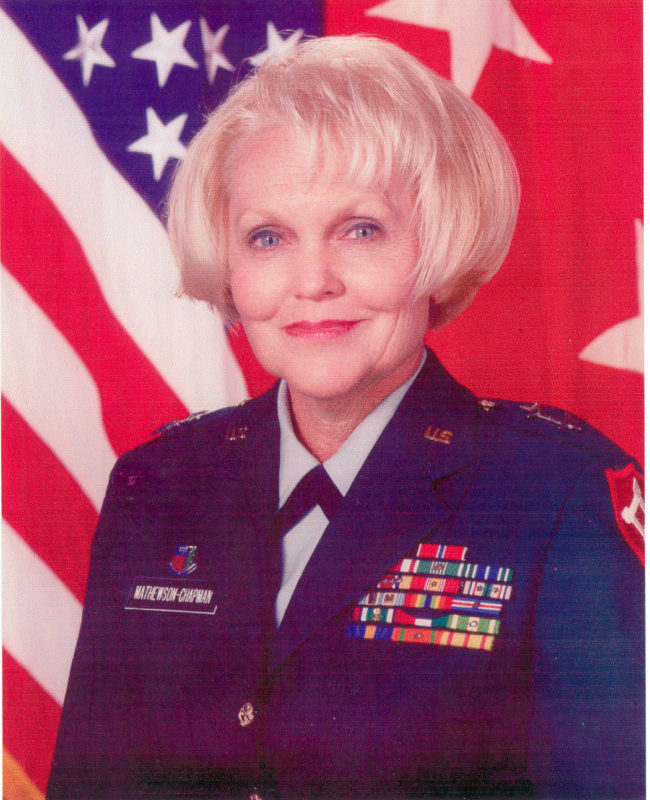 The Major General’s active military service began in 1970 when she was commissioned in the Navy Nurse Corps. She currently serves as Deputy Surgeon General and Special Assistant to the Surgeon General of the U.S. Army/Director, Army National Guard. She also serves as the vice-chair on the National Army Guard Equal Opportunity Committee, and has served as Chairperson of the Adjutant General’s Advisory Council on Minorities’ and Women’s Issues. A powerful health care advocate, she specializes in the field of oncology. The Major General was born in Sabetha, Kansas, and is a graduate of Kansas State University, Trinity Lutheran School of Nursing, the University of San Diego, the University of California, the University of Texas and the University of Florida. She is the recipient of numerous awards and decorations including the Bronze Star Medal, Meritorious Service Medal, Army Commendation Medal, Army Achievement Medal, Army Reserve Component Achievement Medal, National Defense Service Medal, Southwest Asia Service Medal, Army Service Ribbon, Armed Forces Reserve Medal, Army Reserve Components Overseas Training Ribbon, Kuwait Liberation Medal, and the Order of Medical Military Merit Medal. She recently was awarded the highest accolade in military nursing.